Psychological Service Dogs, Inc., was established in 1999 and is a 501(c)3. Our tax ID (FEI #) is 01-0828094. Psychological Service Dogs, Inc., is a dual purpose nonprofit and the first nonprofit in the United States to provide Service Dogs, through rescue, to individuals with invisible disabilities (specifically psychological, emotional or intellectual challenges). We are one of the only nonprofit organizations that utilizes paid and professionally trained Service Dog trainers, thereby insuring that our clients receive a highly skilled Service Dog for their very specific needs. To promote the use of Service Dogs for those with invisible disabilities - emotional, intellectual or psychological. To offer Service Dog training to dogs already in the home or assist with rescuing a dog to be trained as a Service Dog for those with invisible disabilities. To ensure those with invisible disabilities, along with their Service Dogs, be provided with the respect and accessibility they deserve. To educate and train other Service Dog trainers on issues specific to individuals with invisible disabilities. We strive to change all of this. At Psychological Service Dogs Inc., you deserve the assistance you require to live a fuller life. We want to see you welcomed into the community as the unique and empowered individual you are, with access to the same physical and emotional resources as any other individual. We are very proud that 92% of monetary donations go directly into rescuing future service dogs, training, vet bills and placing of service dogs. Invisible disabilities can be emotionally unpredictable, so it is important that the client have a deep connection with his or her Service Dog. Psychological Service Dogs, Inc. is the first Service Dog organization to begin exclusively training dogs in the home for psychological, emotional, and intellectual challenges. With this attention and focus on the invisible disabilities, our dogs are trained with the utmost focus and detail. In addition, being under the umbrella of Center for the Healing Arts connects our clients to some of the most highly trained psychotherapists in the Great Orlando Area. 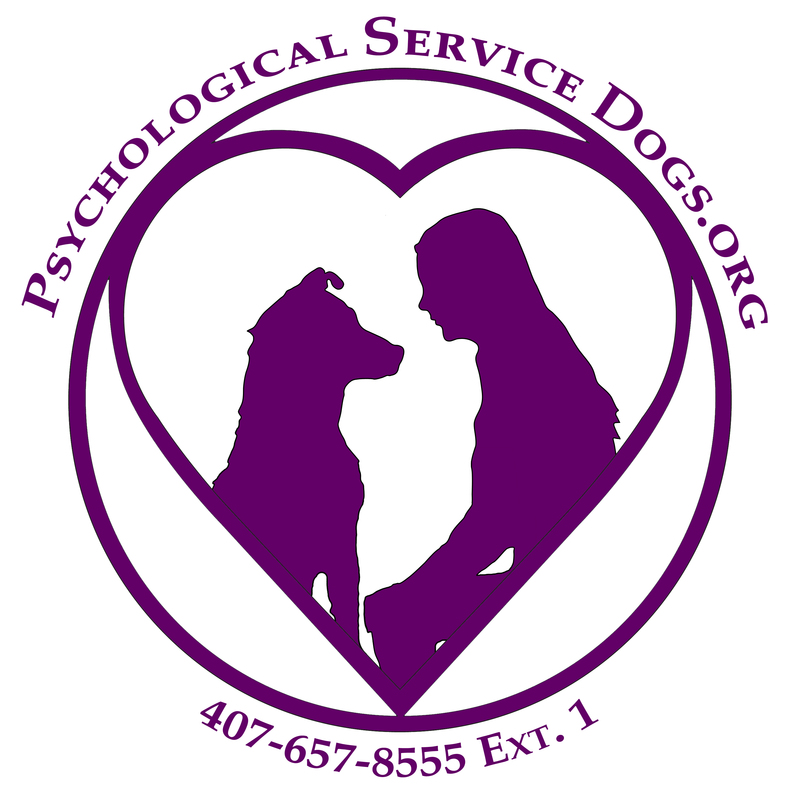 Our psychotherapists are intimately knowledgeable with all aspects of Psychological Service Dogs, Inc. Psychological Service Dog trainers are master dog trainers having studied all over the world, most times for decades. They provide dogs with superior training to assist their handlers with all aspects of psychological, emotionally, or intellectual challenges. Unlike many other service dog organizations, Psychological Service Dogs, Inc strives to train the dog already in the home whenever possible. In addition, Psychological Service Dogs, Inc. operates under the umbrella of Center for the Healing Arts. This aspect connects individuals seeking a Psychological Service Dog to a therapeutic support system should the need arise. Training for dogs and their handlers with psychological, emotional, or intellectual disabilities. Assistance in choosing a suitable Service Dog for training. A client may already have that connection with their personal dog and while all attempts are made to train that dog, there may be instances where the existing dog does not have the temperament suitable to be a Service Dog. In these cases, Psychological Service Dogs, Inc. has partnerships with wonderful rescue organizations and is proud to locate and rescue a wonderful dog to become our clients new Service Dog. Education for other trainers regarding Service Dogs for the psychological, emotional, or intellectual challenges. Educate and prepare professionals in having Service Dogs available as part of their professional lives.